A bit of a puzzle here, as the French Amazon site has listed three versions of the upcoming documentary, "Eight Days A Week - The Touring Years" for future release, one DVD and two Blu-ray listings, priced differently. This may suggest that the more expensive Blu-ray perhaps has more added material, either in the packaging or in the contents. 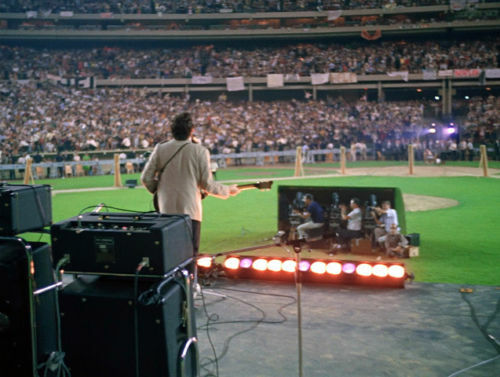 If we had to guess, perhaps the expensive version has the newly remastered Shea Stadium concert as a bonus feature or as a second disc? There's no release date given. Bill Harry, John Lennon's friend and founder editor of Liverpool's own music paper Mersey Beat, reports that he was interviewed for the film, but did not make the final cut. He says that he has been informed that footage from his interview will be included on the DVD/Blu-ray release of the film as bonus material. Hopefully, further bonus material will not only be more talking heads, but more home movie concert footage assembled during research and production. In a recent review of the film by Team Rock, we are informed that "the live footage is riveting: you get several songs in their entirety, the thundering rhythm section and the exchange of exuberant looks giving an idea of how it feels to be centre-stage". In another passage, the review reveals that "there’s a fascinating sequence full of outtakes where they return to the sanctuary of the studio to make Revolver and Sgt. Pepper". Sounds like a formal announcement is forthcoming from Apple concerning the DVD, Blu-Ray, and some kind of deluxe edition with probably both a DVD and Blu-Ray of the movie. It always seems an Amazon site from another country unintentionally tells you what is coming...and Apple needs to either deny it or just give a press release with details of the releases...it should be good. Given that 1+ gave us an extra disc of material, I would say the deluxe version of Eight Days A Week will also have a bonus DVD of material. If it's not Shea, it may be more live footage. -Candlestick Park-San Francisco, California-8/29/66-I know, audio only, but still historically VERY important...maybe with Jim Marshall's photos in a collage. An "old lady"...That's quite a sobering thought. The Beatles are getting towards the point where there is nobody living who was actually around when Beatlemania was going on. Hmm. Thankfully we have much material preserved that will remind people of their greatness. Upon seeing this movie, it seemed to use studio recordings over the original live tracks in Shea Stadium footage. Did anyone notice this? If so why werent the live tracks used? I have heard them at times and they are great so why was this sanitized version presented? -seems a fraud to me especially for a "documentary" of live concert years.